“Beat the batter, not the bowl, lad” My Grandma’s words to my dad when she taught him how to make Yorkshire Pudding. There are certain things in life carry meaning when we create it. For me it is a connection to the past. 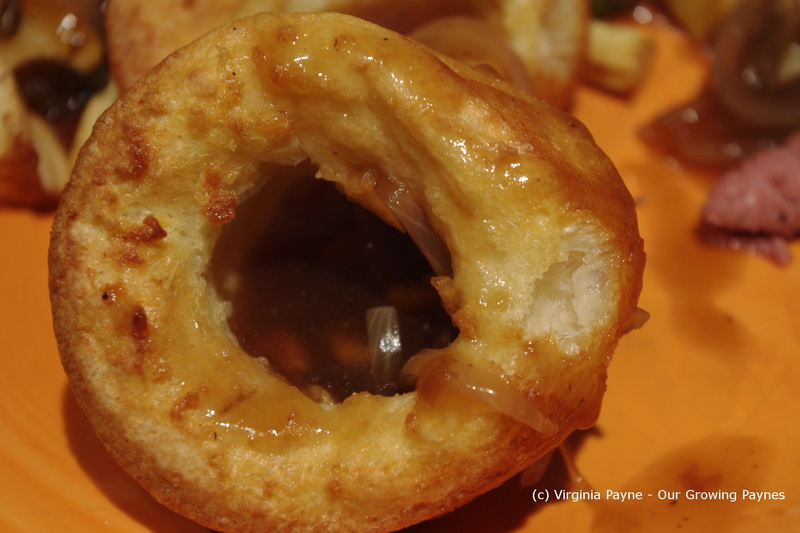 When I make Yorkshire Pudding I think of my Grandma and I think of the time my dad first showed me how to make these. And I hope to pass that to my kids. My best memories are centered around food. The idea of having roast beef without Yorkshire Pudding is alien to me. At their best they can be amazing. Having said that, they can be royally messed up! I’ve set my mum’s oven on fire with overflowed fat. Credit to her that she didn’t throw me out in the snow. And those actually came out really well. Who knew! I’ve also made hockey pucks in the past. This food takes practice. Most recently I’ve been using the recipe from “Good Housekeeping Step-by-Step Cookbook”. It’s a pretty good book that covers the basics and so much more. So we do pull it out from time to time. The recipe calls for 3 T of the pan drippings from the roast beef. I don’t do this as you will see below. 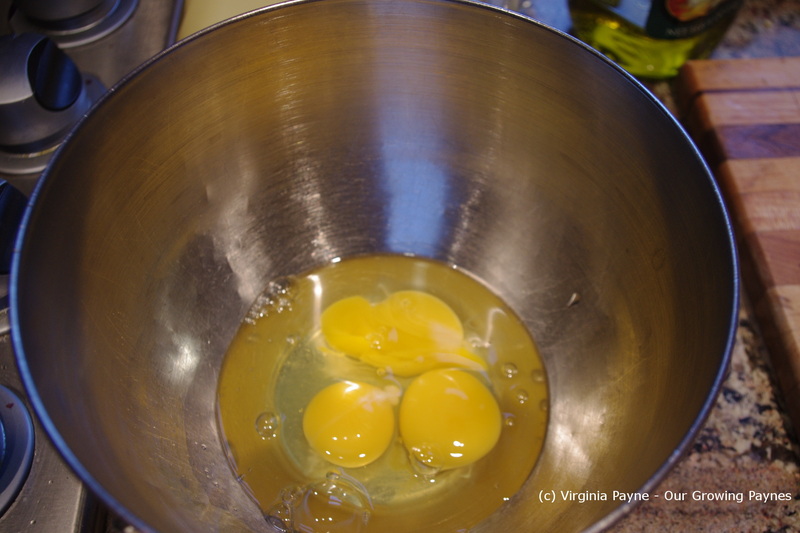 Break the eggs into a medium bowl. Beat them until slightly frothy but not too frothy. Add the flour, milk, and salt. Begin to blend. Here is where the “Beat the batter, not the bowl” comes in. I have found a whisk rather than a fork to do this works better. 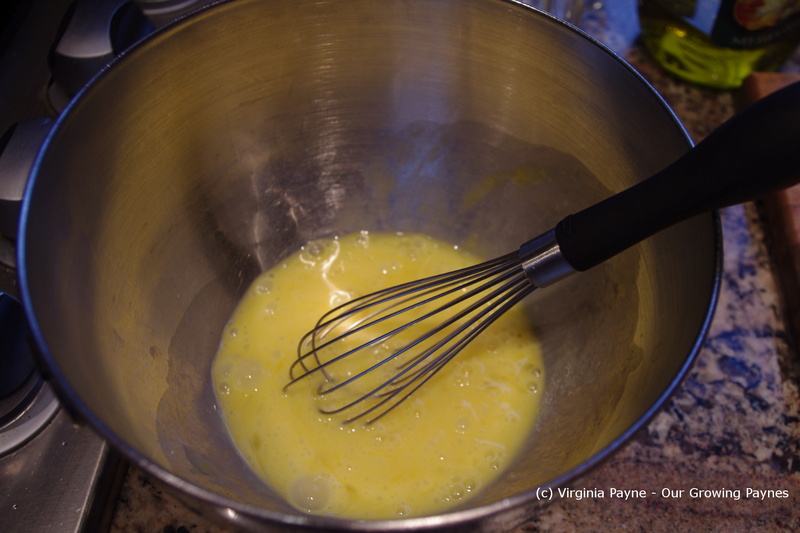 But you want to whisk in a circular motion with the bowl tipped a bit on the side so it is almost a vertical motion. Don’t hit the sides, everything will be incorporated. It makes a flapping sound as you do it. This keeps the air in. 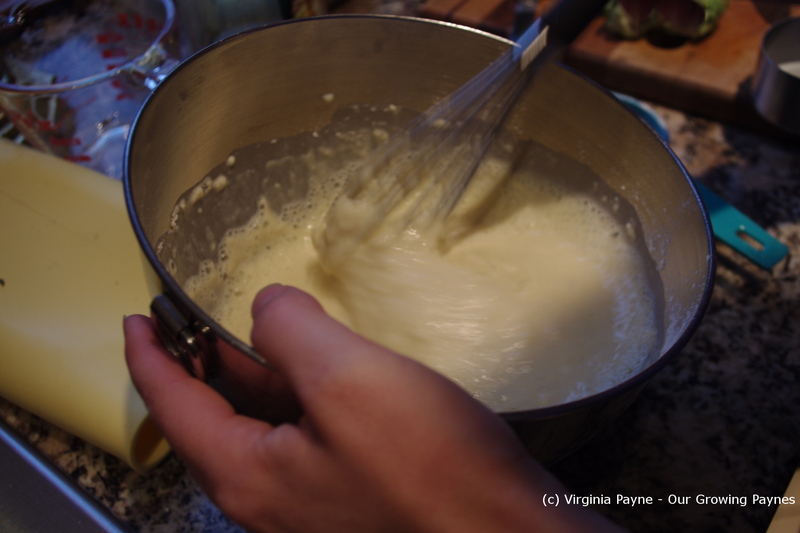 You want the batter smooth without any lumps. If you beat it too much and the air is lacking you get hockey pucks. One thing I discovered this time round was that because of the timing of the dishes I didn’t bake this right off. The batter rested about 20 minutes. This greatly improved everything. Now traditionally the pudding is baked in a large pan. 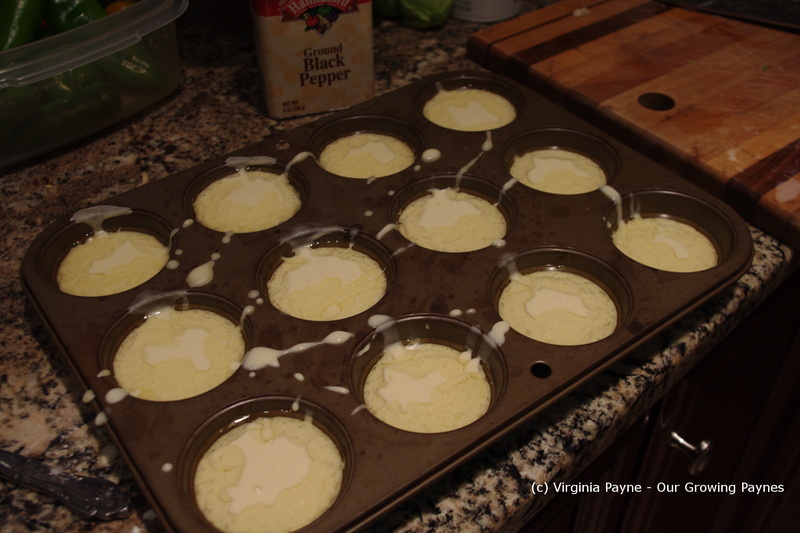 You would put the drippings in the pour the batter over it and bake. I know if you go to the pub in Kettlewell in Yorkshire you get a plate of a large pudding filled with gravy and a plate for the rest of it. I say the pub as there is only one. A small village. I do individual ones. I take a muffin pan and put a heaping teaspoon of shortening in each well. You want enough to cover the well at the bottom when melted. Pop it into the oven to melt. Take the pan back out and fill each well about 1/2 to 3/4 full depending on the size of the wells. Place into the oven to bake 12-15 minutes. Don’t keep opening the door to check! This is very important. Look through the glass. When they are a lovely golden brown remove from the oven. At this point I have to resist the urge to grab one and dip it into the gravy. 🙂 But they are ready to serve. I used the gravy from yesterday’s post of Roast Beef and Gravy. I just love filling those little wells with gravy! 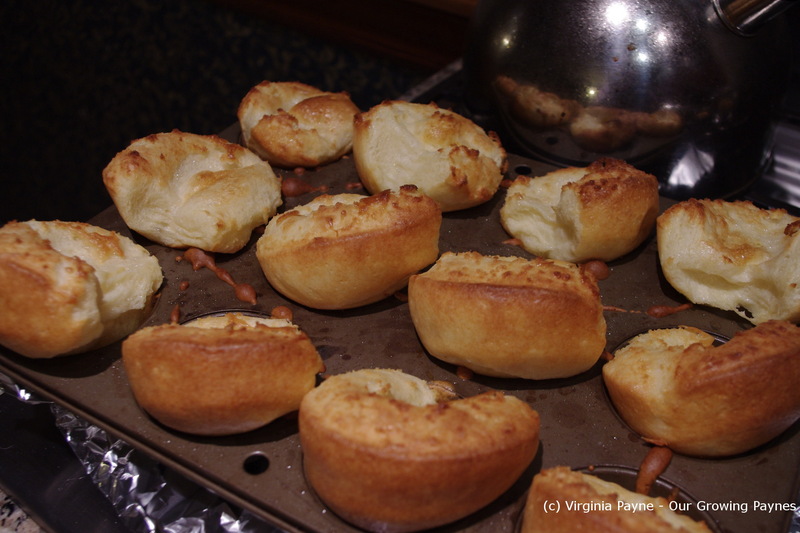 This entry was posted in recipes and tagged baking, cooking, dinner, food, gravy, Yorkshire Pudding. Bookmark the permalink. What would you use for the gravy? This looks so yummy! Something to sop up all that good gravy. so, delicious as they are, they would be used as the first course in Yorkshire in the days of economic hard times. The idea was to fill everyone up with inexpensive food (flour and water) and then there would be less appetite for the meat. Always a real story behind the foods:) Remember the Christmas, two years ago, when the electricity almost failed and my yorkshire puddings really were hockey pucks? Oh, joy. I was wondering about these on your last post. Dip them in gravy! Oh Yumm! It is usually why I decide to do a roast. In the mood for the pudding.